A game of two halves. O'Moore's of Laois won the first one. And the match - 3-9 to 1-9. The preliminary round of the AIB Leinster Intermediate Championship at Parnell's on Sunday afternoon. Many of the Cuala congregation wore red and white hats, and raced down Malahide Road on the final whistle. Shane Plowman looked on. So did Maurice O'Callaghan. Maurice played football for Dublin. He would have admired Amy Loughman's solo without the hurley wide on the right in the first half. It was a grey in Coolock. There was a sting in the air. And the stiffest of breezes. O'Moore's had it in the opening period as it blew down the pitch from the score board end. And they made hay - 3-6 to 0-1 at the break. Cuala had a mountain to climb, and it wasn't the Sugarloaf. But they produced an inspiring second half. They kept tipping over points. Reducing the deficit all the while. And keeping it tight at the back. The volume increased on the terrace under the clubhouse. And O'Moore's didn't manage to score in the second half until the 27th minute. But they had done the heavy lifting. Right from the off, people got the sense that this was a quality side. They weren't the Laois senior champions for nothing. The Circus had set up at the Parnell's ground, but there was no clowning about with O'Moore's. In attack, Amy O'Callaghan was chasing every stray leaf in North Dublin. It brought her two goals. The first of them came on 15 minutes. It gave the visitors a 1-5 to 0-1 lead. Amy, to the left of the posts, palmed in the ball. Their second goal arrived on 22 minutes. Erin Murray got it from close range. And on 31 minutes, following a scramble, O'Callaghan prodded in the third goal. The second half was only seconds on when Sinéad Wylde sent over a Dalkey diamond. It was the perfect tonic. And from then on, Cuala enjoyed a most productive spell. Wylde struck a beauty. She had a stormer. 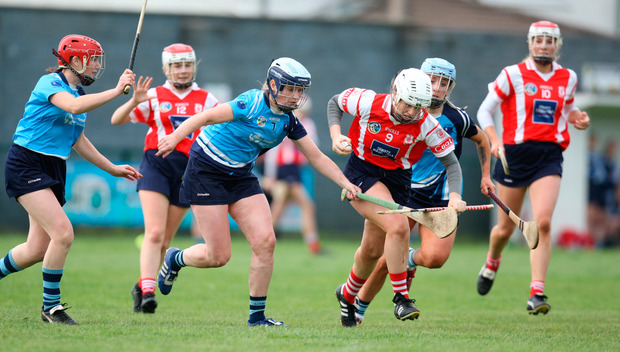 She scored Cuala's point before the interval, which made it 0-3 to 0-1. After the break, she connected with a delicious sideline that came from the book of Joe Canning. Her fourth point was the best of all. One handed, she caught a mid-height pass in full stride and drilled it over from distance. Sinéad Murphy also excelled at centre half-back. She reads the game so well. Following Wylde's two opening points of the second period, Murphy lofted over a free. Then came a gem from Rachel Hartnett, a free from Blaithin Lane and Wylde's wonder point. Jennifer Dunne was denied a goal by Rebecca Williams save on 50 minutes. But Dunne then added a point and Wylde another. Making it eight points without reply. Loughman broke that sequence, and she then ticked on another. Yet deep in stoppage time, Murphy's free found the net.